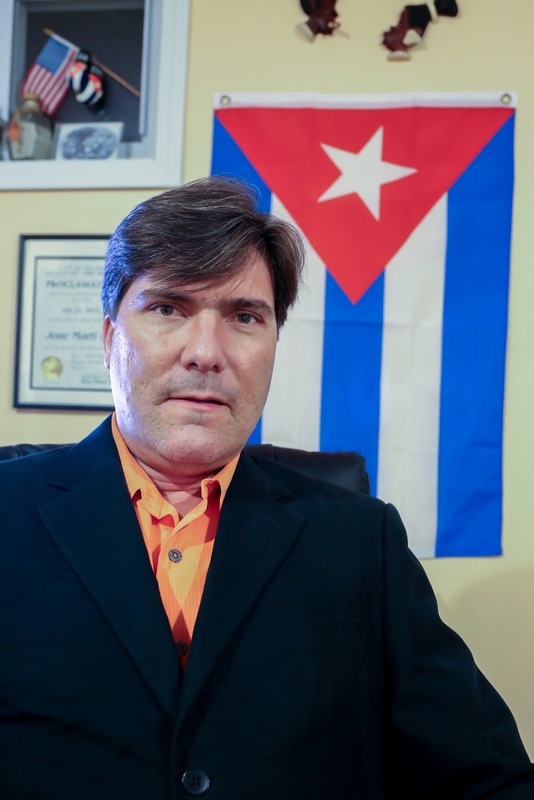 Cuban thankful for freedom "to think, to say, to dream"
FRANKFORT, Kentucky - Luis Fuentes says he arrived from Cuba "with a suitcase full of dreams and nothing else." He literally had nothing else because his luggage was lost in transit. But he held on to his dreams, became a successful environmental engineer in Kentucky and started a magazine aimed at the state's growing Cuban population. He called the magazine El Kentubano. He had coined the term a few years earlier. He didn't want his children to forget their Cuban roots, so he called his daughter, Fernanda, now 12, a "kentubana," and his son, Luis Manuel, 10, a "kentubano." Fuentes, 45, is proud of his heritage and didn't want to lose it once he reached the United States. At the same time, he wanted to learn about and adapt to life in the United States. But there was little information for new arrivals, he says. So in 2009, he launched El Kentubano, which is full of tips on understanding schools, health care, banking, visas, the citizenship process and more. "There was no other source of communication, unlike Miami which had radio and television...newspapers. Here was nothing...no communication for the community," he says. "It was very important because most of the community are people who come directly from Cuba, and they come with zero knowledge about anything. It is a very abrupt change, not only because of the language, not just because of the cold, but because they come with different rules, with a different discipline, with other customs, with habits of labor discipline, social discipline. Everything is new, and information was extremely important for those Cubans who were arriving." The circulation of his magazine has climbed from 1,000 to 10,000 as the Cuban population in Kentucky has grown. U.S. wants to settle Cuba claims "as quickly as possible"
U.S. and Cuban officials have made some progress in resolving billions of dollars in property claims and court judgments that the two nations level at each other, a senior State Department official said. 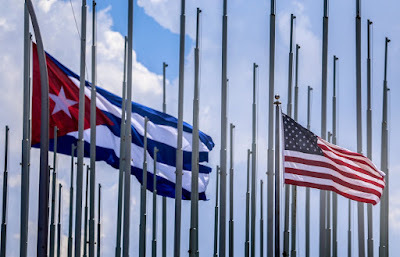 The two sides had "substantive" discussions on Thursday in Washington, D.C., and agreed to meet again in Havana to resume conversions over ways to reach a mutually acceptable agreement, the official said in a background discussion with reporters. Cuba claims that the U.S. embargo has caused $181 billion in "human damages" and $121 billion in economic harm. 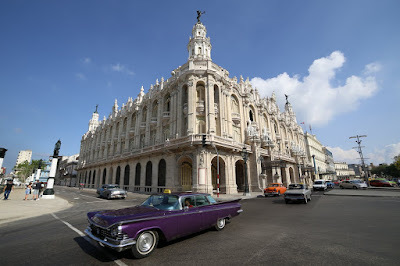 The U.S. government contends that Cuba must settle $1.9 billion in property claims - plus 6 percent interest - in property claims dating from the late 1950s and 1960s; $2.2 billion in court judgments; and hundreds of billions of dollars in mining claims. The senior official said it was premature to try to predict how long it would take the two countries to settle their claims, but said Cuban officials seemed to be taking negotiations seriously. U.S. officials have stated their "desire to resolve claims as quickly as possible," the senior official said. No date has been set for the next round of discussions. "Both sides agreed we'd have more regular meetings," the official said. "We would expect to go to Havana for the next meeting." One year after Washington and Havana restored diplomatic ties, U.S. policy is helping to empower the Cuban people and give them greater autonomy from the socialist government, a senior State Department official said Wednesday. "We remain convinced that our shift from a policy of isolation to engagement is the best course for supporting the aspirations of the Cuban people and the emergence of a peaceful, prosperous and democratic Cuba," said the official during a background briefing with reporters. The official said 700,000 Americans have traveled to Cuba this year, which increased people-to-people contact and boosted private businesses on the island. As the Obama administration sees it, money from such travelers along with remittances from Cuban-Americans makes it easier for ordinary Cubans to move beyond the daily struggle to feed their families and think about the future. They are "better equipped to express their demands on the Cuban state and what they would like to do to be able to lead better lives," the senior official said. The official declined to speculate on how U.S. policy might change once President Obama leaves office, but said many of the administration's measures to loosen restrictions on dealing with Cuba have become institutionalized. "I would never speculate on what a next administration may do," the official said, "but I think to the extent that this has yielded these positive results for the United States, for the Cuban people, it would be difficult to go backwards." 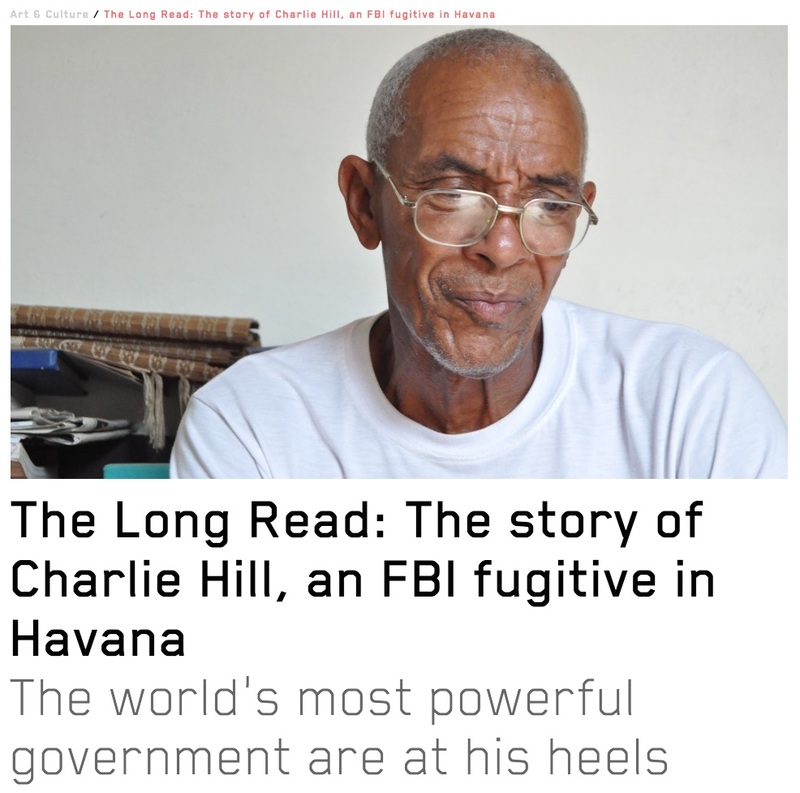 The lawyer for Charlie Hill, an American fugitive living in Cuba, released a statement Wednesday objecting to a March magazine article about Hill. 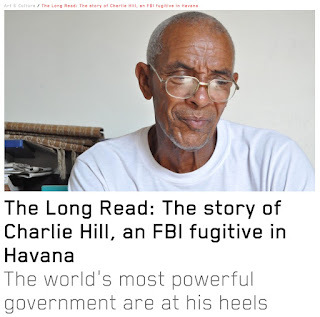 In late March of 2016, Huck Magazine published a lengthy article that contained numerous inaccuracies regarding Mr. Hill, an African-American human rights activist who was forced to flee the United States in 1971 due to political repression. Mr. Hill has since resided in Havana as a guest of the Cuban government. The Huck Magazine article so egregiously mischaracterizes and misstates Mr. Hill’s positions that we are necessarily compelled to immediately enter into litigation against Huck Magazine for fraud, libel and false light. Neither Mr. Hill nor his undersigned attorney were duly notified by Huck Magazine of their intent to publish this article. Mr. Hill is immensely respectful and appreciative of the Cuban government and has been honored to be a small part of its democratic revolution. He has dedicated his life to the ideals of the Cuban Revolution and the dignity of the poor and disenfranchised throughout the world. The U.S. Embassy in Havana is passing out grants ranging from $1,000 to $100,000 to individuals and organizations based in Cuba and non-profit organizations in the U.S.
Two project announcements, reproduced below, say that "projects that are inherently political in nature" aren't likely to be funded. I doubt this means that the State Department and the Agency for International Development have ended other more expansive programs that are political. But the goal of these embassy projects is to strengthen U.S.-Cuba bilateral relations. Applications for the embassy projects "will be considered on a rolling basis up until August 15, 2016," the announcement said. When Barack Obama visited Cuba, he declared, "It is time, now, for us to leave the past behind." 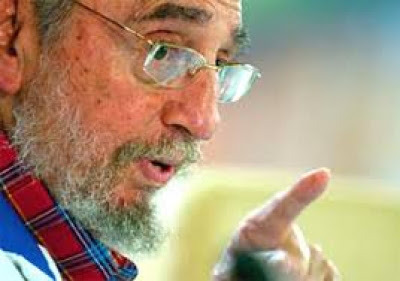 Not so fast, Fidel Castro said in a column published today in Granma. The former president's advice to Obama: Mind your own business. My modest suggestion is to reflect and do not try now to develop theories about Cuban politics. The past can't be forgotten, Castro wrote, "after a merciless blockade that has lasted almost 60 years." And those who have died in the mercenary attacks on ships and Cuban ports, an airliner full of passengers detonated in midair, mercenary invasions, multiple acts of violence and strength? 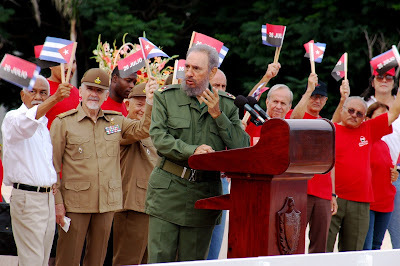 Castro said the Cuban people aren't about to give up "the rights and spiritual wealth earned with the development of education, science and culture." He also said Cubans are fully capable of producing the "food and material wealth we need with the effort and intelligence of our people." Just three days after Barack Obama left Cuba, the State Department today announced a $753,989 community internship program targeting "young emerging leaders from Cuban civil society." Non-profit organizations and educational institutions are invited to submit proposals. The deadline is May 20. The first awards are expected to be given in late July or early August. 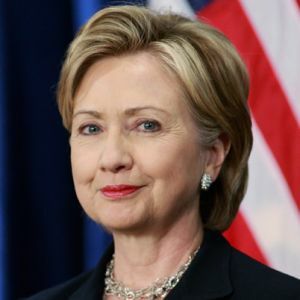 The State Department's Bureau of Western Hemisphere Affairs plans to manage the program, aimed at financing two- to four-month professional development programs "which will fuel the participants’ development of action plans for nongovernmental community activities in Cuba." "Cuban civil society is not formed into well-established organizations that would typically be found in a society with a strong democratic tradition. Through participation in the program, participants will develop a set of leadership tools and skills to manage and grow civil society organizations that will actively support democratic principles in Cuba." 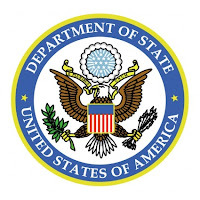 The United States Department of State’s Bureau of Western Hemisphere Affairs (WHA) announces a Notification of Funding Opportunity (NOFO) to support the Community Internship Program for Cuban Youth. Subject to the availability of funds, WHA intends to issue an award in an amount not to exceed $753,989 in FY2015 Economic Support Funds for a project period of three years. The anticipated start date for this activity is August 2016 and WHA intends to support one award as a result of this NOFO. Since when a President of a foreign government visits a country and explains to the people his vision for their country? Unless, of course, he considers himself the Emperor of the Universe with a right to sermon (sermonear) his listeners. 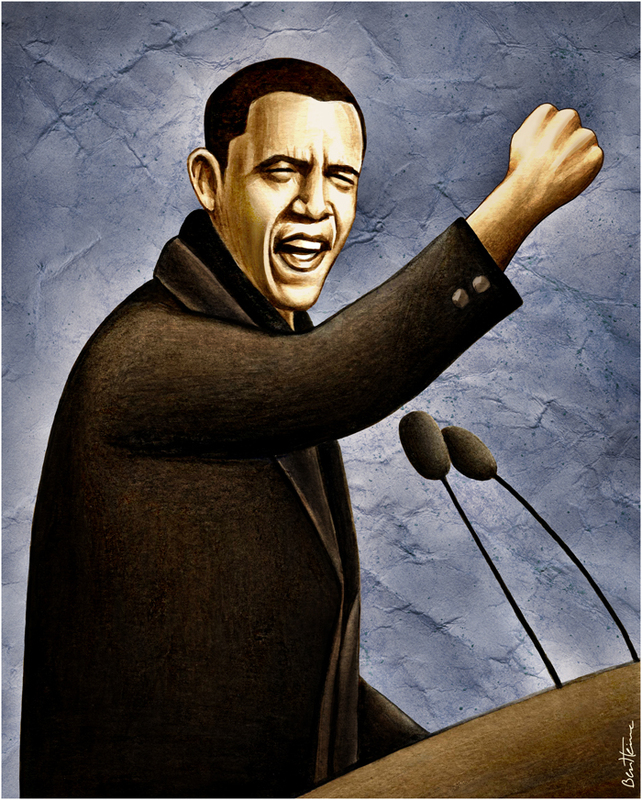 There is another possibility, Obama is announcing his campaign to become President of Cuba en 2018. Ben Rhodes, Obama's deputy national security adviser who has helped engineer the diplomatic rapprochement with Cuba, made clear in the story that Obama isn't trying to impose his will. Ultimately he will make clear that that's for the Cuban people to decide. We have great confidence in the ability of the Cuban people to do extraordinary things. 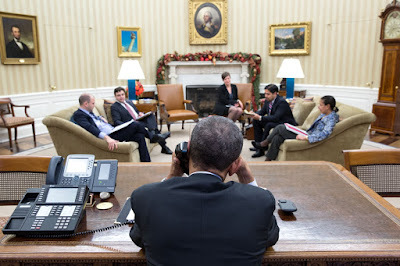 Barack Obama speaks to Cuban President Raúl Castro from the Oval Office on Dec. 16, 2014. White House Photo by Pete Souza. Yet even as Obama makes his historic journey to Cuba, others in the U.S. government remain intent on shaping the destiny of Cuba. The U.S. Agency for International Development continues operating democracy programs in Cuba that the Cuban government regards as illegal. In January, USAID announced $6 million in grants to "provide humanitarian assistance to political prisoners and their families, and politically marginalized individuals and groups in Cuba." 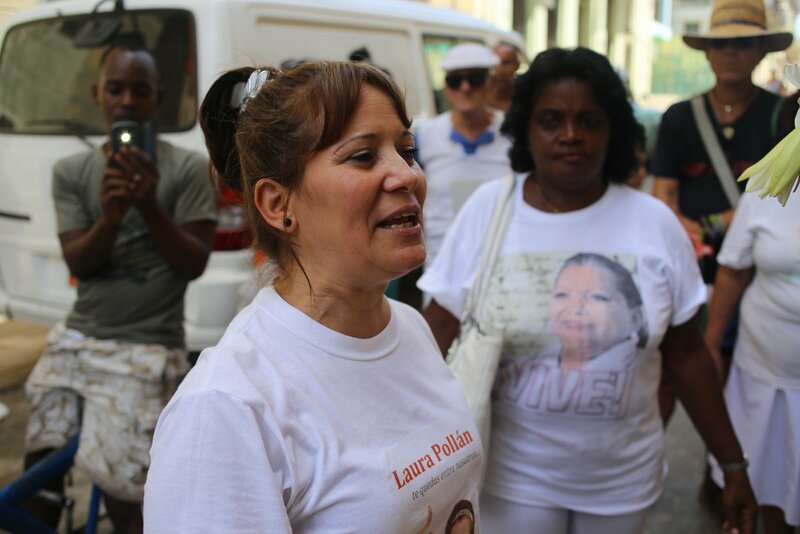 Laura Labrada Pollán's faction of Las Damas de Blanco, or Ladies in White, has requested a meeting with President Barack Obama during his visit to Cuba on March 20 to March 22. Labrada Pollán is based in Havana. Her mother, the late Laura Pollán, helped found Ladies in White in 2003. Berta Soler leads a second Ladies in White group in Havana. Quisiera darle la más cordial bienvenida a nuestro país y desearle una feliz estancia en esta tierra, que desde ya puede sentir como suya. Cuba y los Estados Unidos de América comparten una larga historia de amistad, que no se han podido borrar de la mente de ambos pueblos durante más de 57 años de dictadura en mi país. Ya es hora que nuestros ciudadanos se encuentren a mitad del puente y lo que ellos sientan no pueda ser separado por ningún gobierno o grupo. The State Department on Friday blamed "scheduling issues" for the cancellation of John Kerry's previously announced visit to Cuba and says the secretary will travel to the island with Barack Obama later this month. Earlier news reports had said Kerry had decided not to travel to Cuba in advance of the president because Cuban officials were supposedly refusing to allow him to meet with Cuban dissidents. MR KIRBY: Hey, everybody. Happy Friday to you. Got a couple things at the top then we’ll get on going there. First, a call readout: This morning, Secretary Kerry spoke by phone with Cuban Foreign Minister Bruno Rodriguez about President Obama’s upcoming trip to Cuba. Both ministers reiterated their commitment to making the visit a success and to ensuring that the path to normalization continues in the positive direction that it’s already taken. The Secretary told the foreign minister that the President is very much looking forward to the trip and to meeting with a wide array of Cuban officials and citizens to include members of civil society. 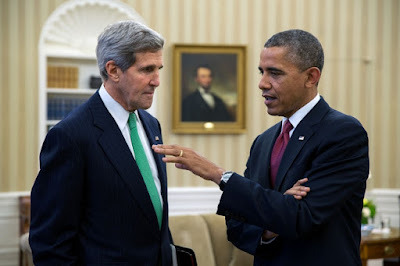 Secretary Kerry expressed his own disappointment, of course, that scheduling issues prevented him from making a trip ahead – a trip to Cuba ahead of the President, but that he expects to be accompanying President Obama on this very historic occasion. 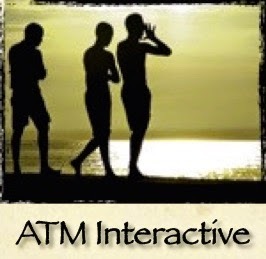 A multimillion-dollar U.S. government-financed program was aimed at, among other things, developing an "information program focusing on the impact of foreign investors and foreign tourists on Cuba" and sensitizing the "business community and foreign leaders about the labor conditions and tourist apartheid in the island." That's according to a document that the U.S. Agency for International Development released on Jan. 19 in response to a Freedom of Information Act request that I made on Oct. 8, 2011. The document describes a contract that USAID awarded to the Center for a Free Cuba in Washington, D.C., for a program called, "Uncensored Cuba." The contract ran from March 31, 2005, to April 30, 2009, and was worth up to $7,231,663. 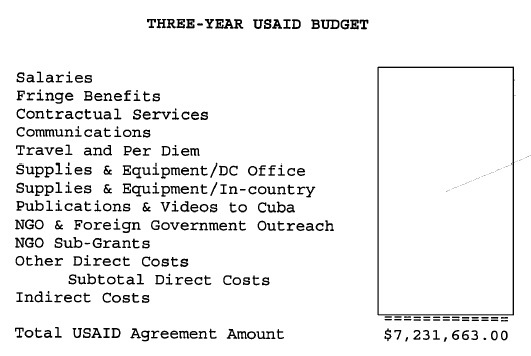 USAID wound up paying the Center for a Free Cuba $6,652,853.12. 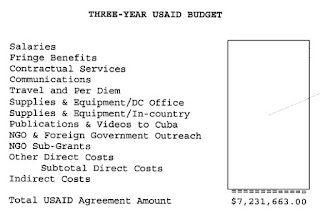 USAID censored details of Uncensored Cuba's budget, redacting the salaries, fringe benefits, communications, travel and other costs. The U.S. Agency for International Development on Thursday announced that it is offering $6 million in grants over a three-year period to organizations that will "provide humanitarian assistance to political prisoners and their families, and politically marginalized individuals and groups in Cuba." Grant amounts will range from $500,000 to $2 million. The application deadline is Feb. 25. In the grant notice, USAID warns against sending American citizens to Cuba. Special thought and consideration should be given to the selection of consultants and other personnel who may be required to travel to the island. To the extent possible, travel by American citizens should be avoided. 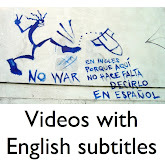 It is preferable for these personnel to speak Spanish fluently, possess solid understanding of the cultural context, and have prior experience on the island, in order to maximize their effectiveness in this unique operating environment. The U.S. government cannot ensure the safety and security of Recipient assets and personnel, particularly as relates to individuals traveling to Cuba under USAID funding, or project staff based in Cuba. 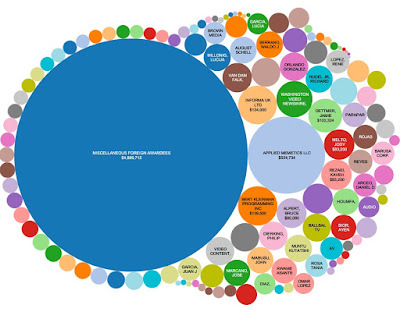 Implementation of USAID programs in Cuba requires Recipient awareness of political sensitivities and assumption of risks associated with hostile actions of the Cuban government. The Recipient will not serve as an agent or act under the direction of USAID and will be responsible for the efficient and effective administration of its own programs with sound business judgment, including any precautions inherent therein. ...the Recipient shall not hold USAID liable for injury, death, detainment, incarceration, kidnapping, property loss, damages, or expenses incidental to those liabilities, suffered by, or attributable to the acts, omissions or negligence of, the Recipient, its agents, or its employees implementing programs in Cuba under this NFO. By supporting civil society and promoting the free flow of information to, from, and among the Cuban people, the President and the U.S. aim to empower the Cuban people to decide their own destiny. USAID says the program is justified because "the Cuban government currently is detaining dozens of political prisoners for peacefully exercising their right to freedom of expression." The grant notice says that by the end of 2015, there had been at least 8,616 political arrests in Cuba. 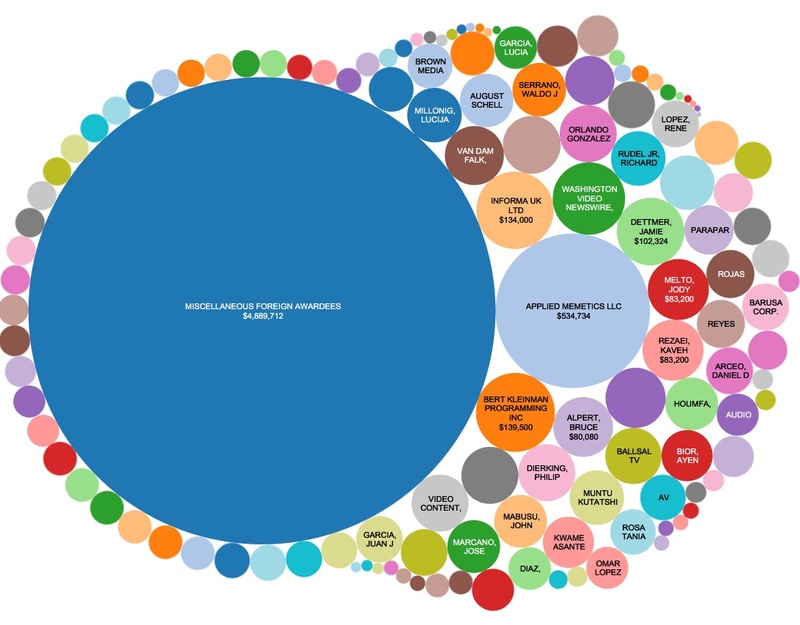 Without getting into the merits or potential pitfalls of USAID's program, I think it's worth pointing out that many of those arrested for political reasons are taking part in programs funded by the U.S. government or U.S. government-financed organizations. I am not arguing for or against such programs or saying there are no human rights violations in Cuba, but I find it interesting that existing U.S. government programs are used to help justify and fuel the need for new programs. 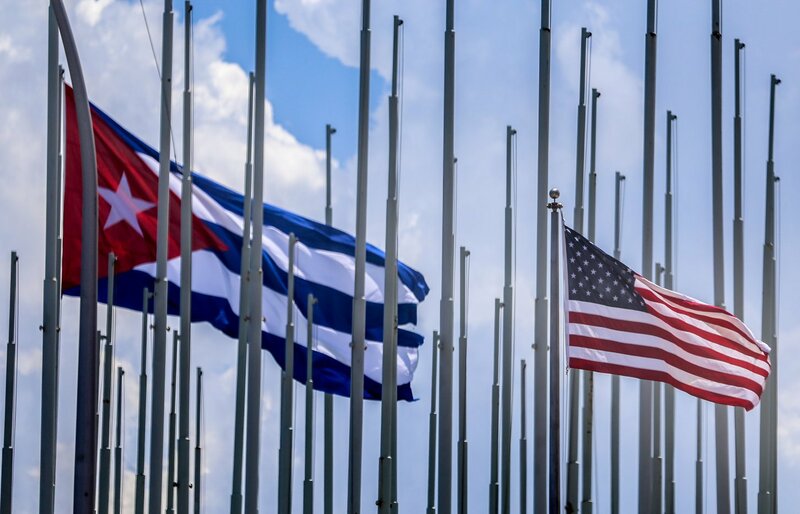 On July 20, 2015, the United States and Cuba formally re-established diplomatic relations and re-opened embassies in each other’s respective countries. The establishment of diplomatic relations allows the U.S. to discuss matters of mutual concern that would advance U.S. national interests, such as migration, counternarcotics, disaster response, environmental protection, and support for human rights. By supporting civil society and promoting the free flow of information to, from, and among the Cuban people, the President and the U.S. aim to empower the Cuban people to decide their own destiny. Cuban native Otto Macias is a former combat infantryman who fought in the Vietnam War in the ‘60s before returning to the United States, his adopted homeland. But in 1981, with no notice, the Department of Veterans Affairs abruptly cut off his benefits. 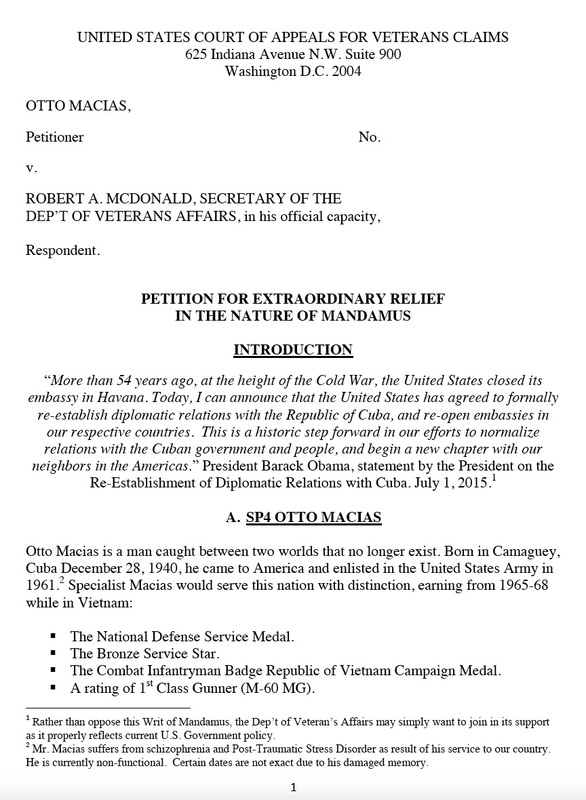 Macias was a U.S. citizen, but he had gone back to Cuba and, as the VA saw it, paying him violated the embargo. 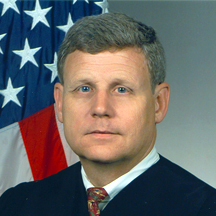 Flores-Williams filed his petition on behalf of Macias in the U.S. Court of Appeals for Veterans Claims in Washington, D.C. The lawyer had traveled to Havana in 2015 to meet with Macias and his relatives. He learned that Macias was born in Camagüey in 1940. He moved to the U.S. in 1961 and enlisted in the U.S. Army. Macias was trained as a sharpshooter and a 1st Class Gunner and operated the M60 machine gun. He served in Vietnam from 1965 to 1968, earning the National Defense Service Medal, the Bronze Service Star and the Combat Infantryman Badge Republic of Vietnam Campaign Medal. He lived on the streets, slept on park benches: he was the homeless Vietnam Veteran that people step over on their way into the coffee house, the Iraq War veteran sleeping in his Chevy in the parking lot behind the mall. His family in Cuba thought he was dead. But Mr. Macias was an American war hero, broken but unbowed, a man who had lived through hell and refused to die. In 1976, he was found on the streets and taken in by friends. He applied for and was granted citizenship. In March 1979, the VA was paying Macias $295.83 per month in non-service connected benefits. 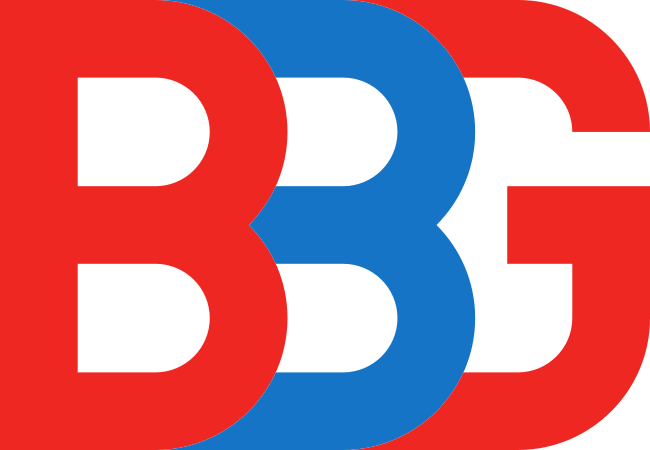 The agency boosted the amount to $325.16 three months later before dropping it to $60 per month. In October 1980, the State Department gave Macias permission to travel to Cuba to visit his family for one week. He had intended to return to the U.S., but began suffering hallucinations while in Havana and was hospitalized. He suffered a mental breakdown while in Havana. We cannot say why, perhaps the ghosts of the other world. He was delusional, hallucinating, caught between lands – one of the nameless millions lost to the fog of war. Mentally disabled, formally diagnosed with schizophrenia, he was hospitalized for three months. 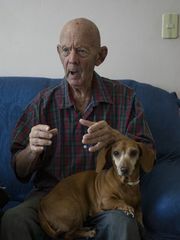 He did not intend to stay in Cuba, but was now unable to live on his own. Mr. Macias has remained in the kind care of his family in Havana since 1981. The VA terminated his benefits in August 1981. At the time, the Veteran’s Benefits Manual stated that the VA must follow Treasury Department regulations, which said payment of benefits to anyone on the island violated laws banning trade with Cuba. “The effect of these regulations was to make nearly all U.S. financial transactions with Cuba illegal, so that even a disabled American war hero, like Otto Macias, was prohibited from receiving the benefits earned in service to our nation,” Flores-Williams wrote. In July, President Obama announced that the U.S. and Cuba had restored diplomatic relations. The Treasury and Commerce departments have since revamped their policies toward Cuba, but the VA has failed to do so. 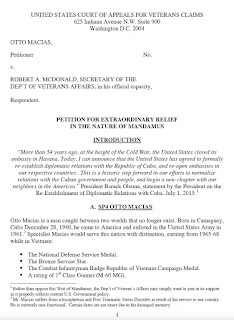 Perhaps – and this is a debatable perhaps – at one time the governmental interest in maintaining the Cuban Embargo could be used as a justification for denial of Mr. Macias’ right to due process and equal protection, but the laws have now changed and the VA must update its policies to be in compliance with them – so that Mr. Macias’ benefits should now be restored. Mr. Macias is in the last days of his life. Along with his schizophrenia and PTSD, he is suffering from skin cancer. Without the expeditious intervention of this Honorable Court, he will die without ever having been afforded the due process and benefits that he has so rightly earned. This Court can use this historic opportunity to move the VA to review its policies regarding the Cuban Embargo, so that it follows the lead of the U.S. Departments of Treasury and Commerce. We cannot say with certainty how many thousands of Cuban-American veterans have been negatively impacted by the Cuban Embargo, but ordering the VA to update its policies will help to bring them in from the cold. The situation is historical. It is extraordinary. There are no other adequate means by which to address this deficiency in VA policy. 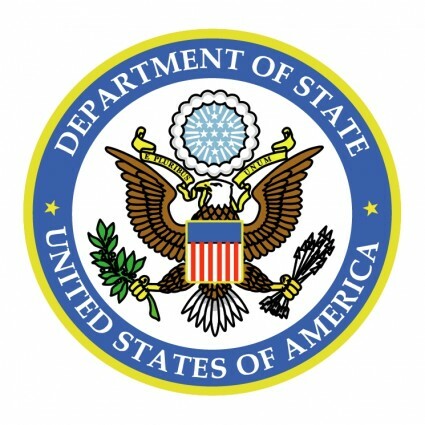 The Bureau of Democracy, Human Rights and Labor (DRL) announces a Request for Statements of Interest (RSOI) from organizations interested in submitting Statements of Interest (SOI) outlining project concepts and that have capacity to manage projects that will foster civil, political, and labor rights in Cuba. PLEASE NOTE: DRL strongly encourages applicants to access immediately www.grantsolutions.gov or www.grants.gov in order to obtain a username and password. GrantSolutions.gov is highly recommended for all submissions and is DRLs preferred method of receiving applications. To register with GrantSolutions.gov for the first time, click “Login to GrantSolutions” and follow the “First Time Users” link to the “New Organization Registration Page.” On the next page, click on “Continue the GrantSolutions registration process without a DUNS number” if you do not have a DUNS number and sam.gov registration. Otherwise, select the option that best fits. For more information, please see DRL’s Proposal Submission Instructions (PSI) for Statements of Interest, as updated in July 2015, available at: http://www.state.gov/j/drl/p/c12302.htm. The submission of a SOI is the first step in a two-part process. Prospective applicants must first submit a SOI, which is a concise, three-page concept note designed to clearly communicate a project idea and objectives without requiring development of a complete application. Upon review of eligible SOIs, selected prospective applicants will be invited to expand their ideas into an application. 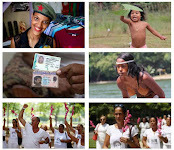 The intention of requesting SOIs first is to provide prospective applicants the time to develop ideas to promote internationally-recognized individual, civil, political, and labor rights - as set forth in the Universal Declaration of Human Rights and other international instruments - in Cuba.